The touring company of Nothing On, a British farce, is hurriedly running through it’s final dress rehearsal. During the first act you’ll be treated to this play within a play and a cast who can’t seem to remember their lines, entrances, or exits. The director feverishly shouts out directions only to be ignored until Act Two. When suddenly the set flips and you’re now watching the backstage of this play within the play. The play has plunged into hysterics! The chaos and disorder of performing a play is too much for all involved. Then we reach Act Three. A month later and you would think the play has gotten better…but it hasn’t. It has devolved into sheer, hilarious insanity. Join us for the greatest farce ever written! 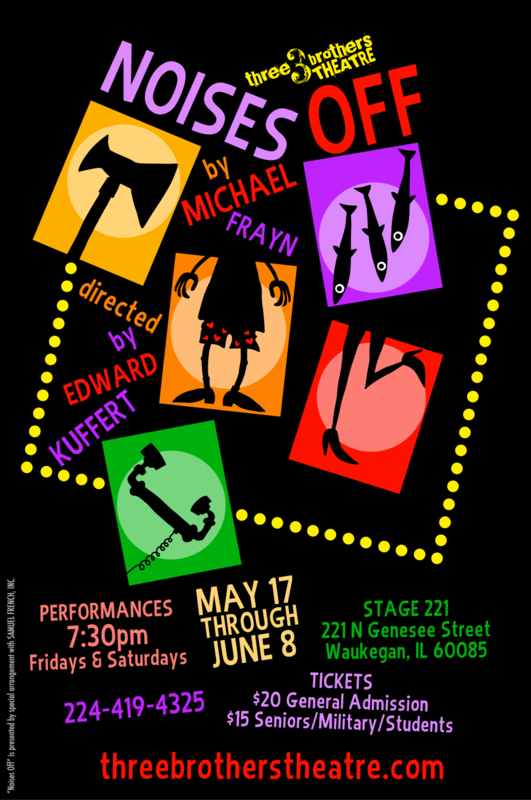 “Noises Off” is presented by special arrangement with SAMUEL FRENCH, INC.
Playwright, novelist and translator Michael Frayn was born in London on 8 September 1933. After two years National Service, during which he learned Russian, he read Philosophy at Emmanuel College, Cambridge. He then worked as a reporter and columnist for The Guardian and The Observer, publishing several novels including The Tin Men (1865), winner of a Somerset Maugham Awart, The Russian Interpreter (1966), which won the Hawthornden Prize, and Towards the End of the Morning (1967). More recent novels include A Landing on the Sun (1991), which won the Sunday Express Book of the Year and Headlong (1999), the story of the discover of a lost painting by Bruegel, shortlisted for the Booker Prize for Fiction. His latest novel, Spies (2002), a story of childhood set in England during the Second World War, won the 2002 Whitbread Novel Aaward and the 2003 Commonwealth Writers Prize (Eurasia region, best book), and was shortlisted for the Whitbread Book of the Year. Michael Frayn is also the recipient of the 2002 Heywood Hill Literary Prize.